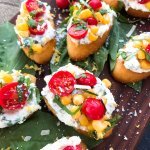 Tomato Corn Basil Crostini with Herbed Ricotta Cheese are fresh and light, perfect for summer party entertaining. Are you ready for warm weather? Because I am. 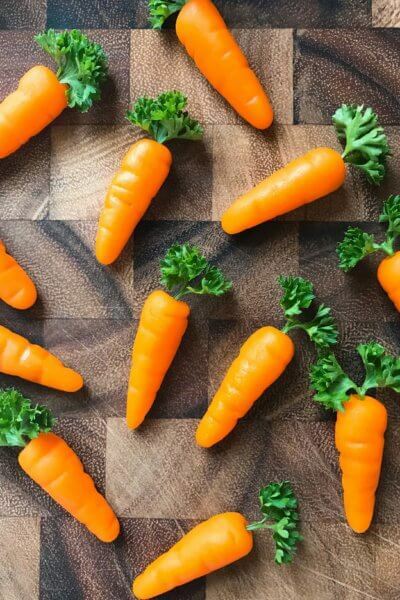 When the weather starts to get warm and spring is in full gear, I love whipping up as many fresh and light recipes as I can. 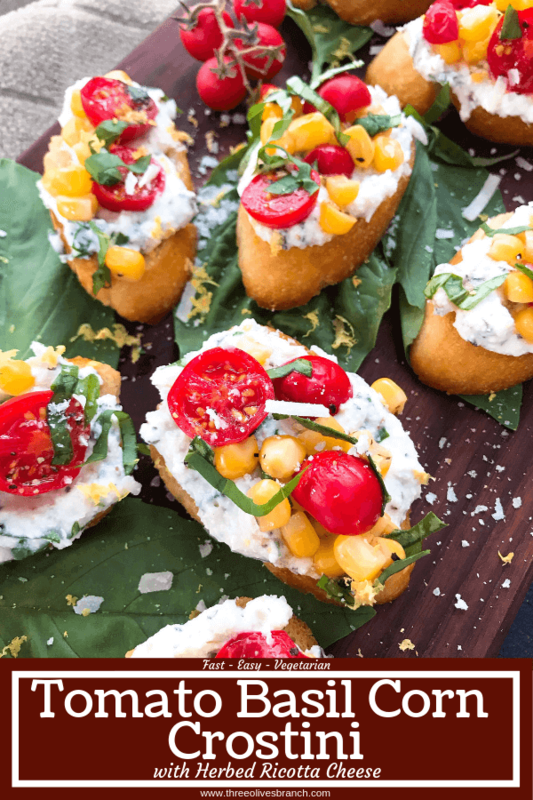 These Tomato Corn Basil Crostini with Herbed Ricotta Cheese are a celebration of warm weather. 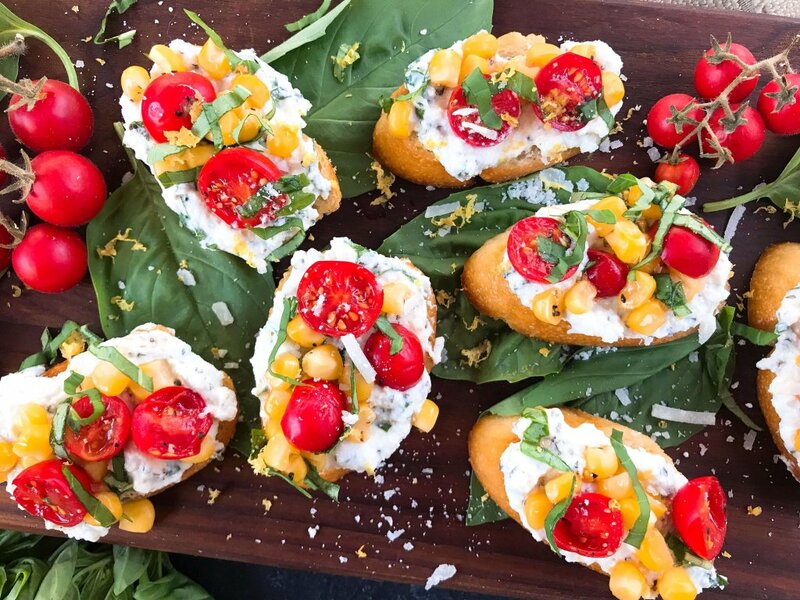 Full of fresh and bright flavors, the crostini are filling while not being heavy. 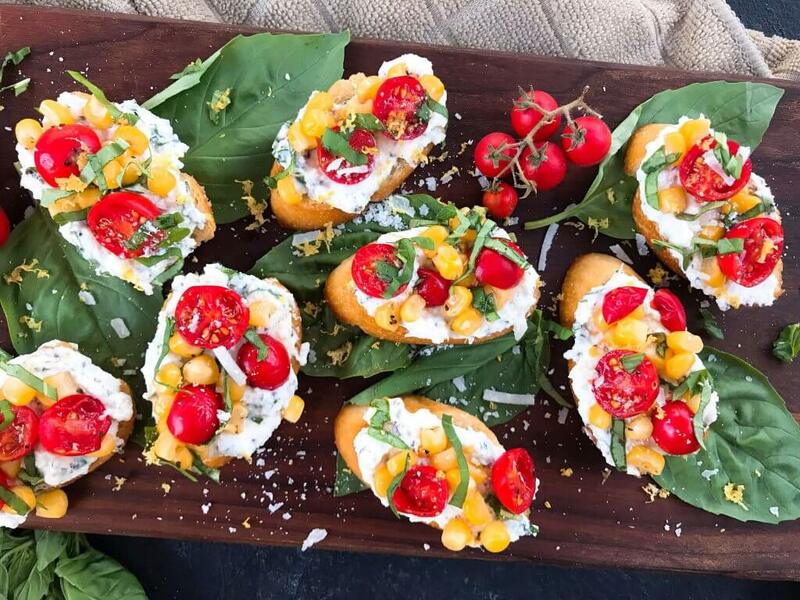 These Tomato Corn Basil Crostini with Herbed Ricotta Cheese just scream warm weather to me. The acidity of the lemon brings an extra freshness to the already fresh corn and tomatoes. 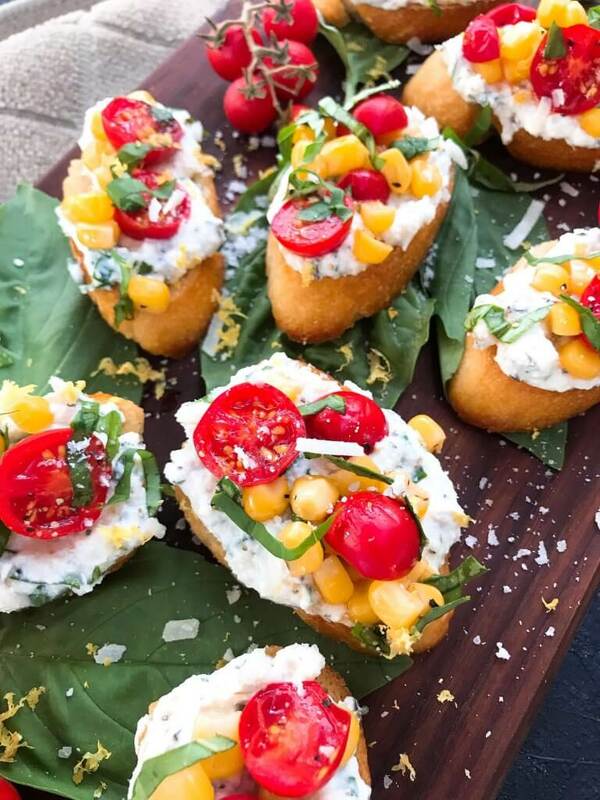 And crostini are perfect for any type of entertaining or party. 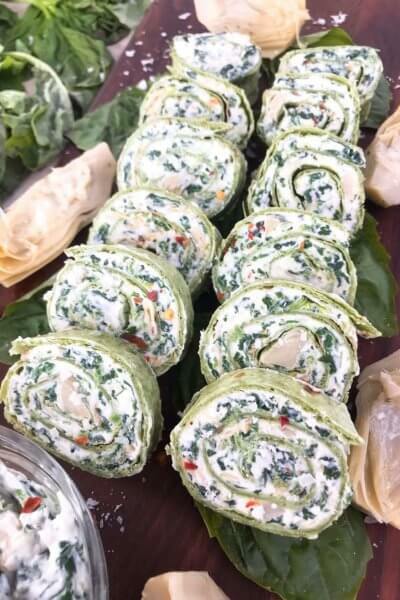 They are a great finger food that is simple to prepare and a lot of flavor. 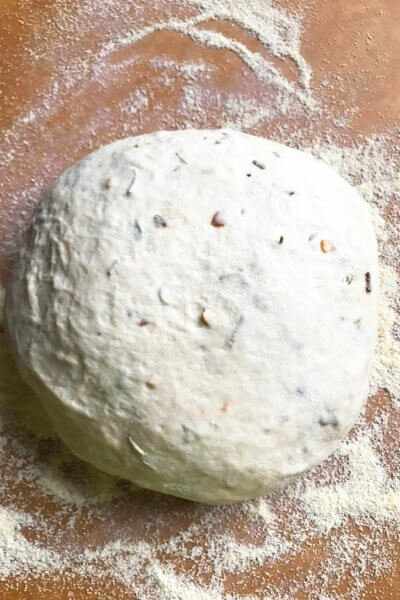 Learn how to make the base crostini here! I am a big fan of crostini. There are so many toppings you can put on crostini. 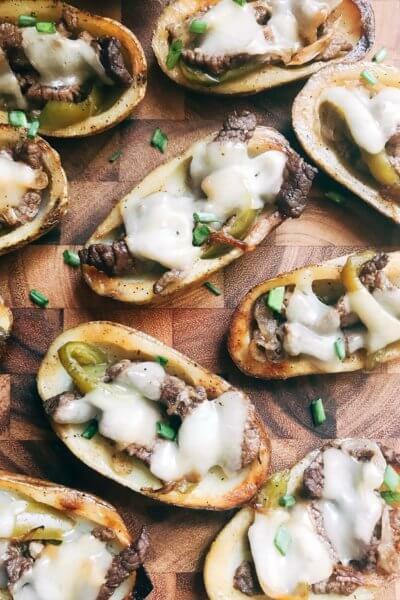 It is such a versatile appetizer and party food. Find all of our crostini recipes here! 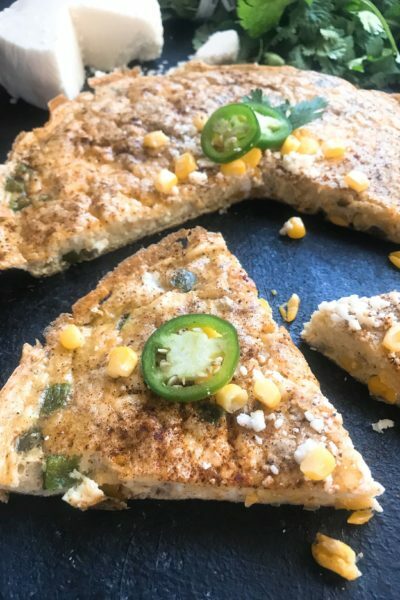 Fresh corn always taste best in recipes like this, but if it is out of season or not convenient, you can easily swap out frozen corn. Just thaw and drain the corn, then proceed as directed. Canned corn could also work however I recommend frozen because the canned liquid alters the flavor of the corn. You can zest a lemon or other citrus fruit with a microplane. I am a firm believer in not having kitchen gadgets for one use. This microplane is not only used often for citrus zesting but great for cheese as well! I use mine all the time and it is definitely worth having if you do not have one already. Get a microplane here! 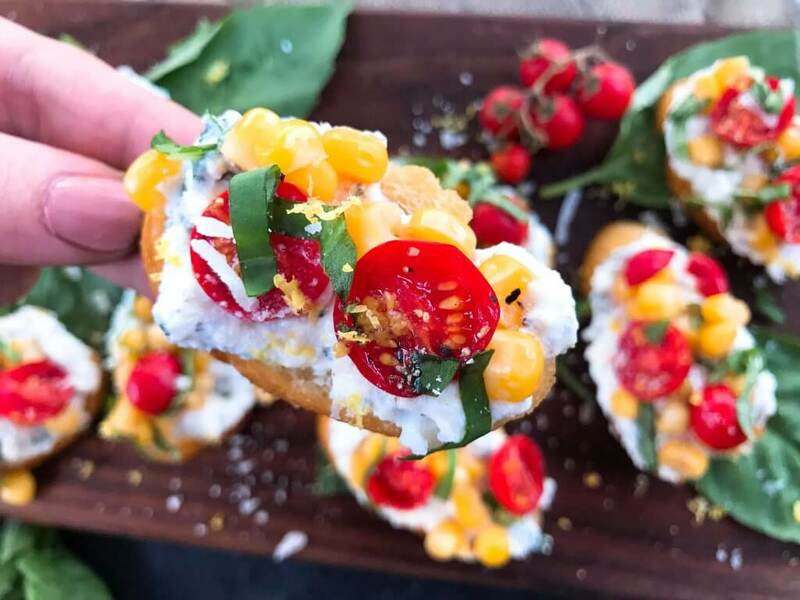 Cook your crostini rounds as per recipe instructions through the link below if not done already. This can be done up to two days in advance and the crostini kept in an airtight bag or container. Make sure the crostini are completely cooled before storing otherwise the trapped heat moisture will re-soften them. Zest the lemon and set the zest aside. Cut the cherry tomatoes in half and place in a small bowl. Add the corn, 1/4 cup fresh basil strips, a pinch of salt and a pinch of black pepper. Drizzle with olive oil. Squeeze a half of a lemon into the tomatoes. Stir to combine and set aside. 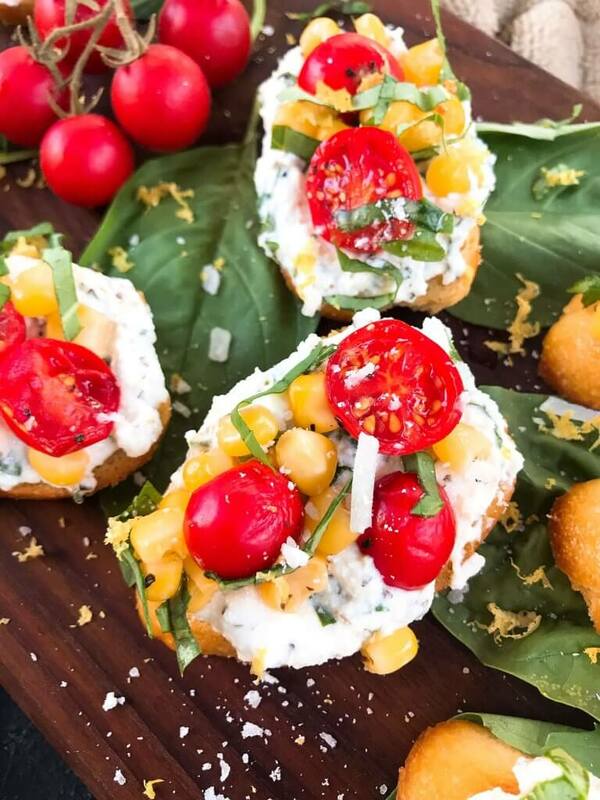 In a second small bowl: Make your cheese mixture by combining the ricotta, juice from 1/2 lemon, Parmesan cheese, 1/4 cup fresh basil, salt, and pepper. Chill the cheese and tomato mixtures separately until ready to serve. When ready to serve, assemble the crostini by spooning approximately 1-2 Tablespoons of the cheese mixture on each crostini. Then add 1-2 Tablespoons of the tomato mixture. Repeat with all crostini pieces. Sprinkle the crostini with the lemon zest and additional basil if desired. Serve immediately. Learn how to make the base crostini here! To ensure a truly vegetarian dish, make sure you are using vegetarian cheeses. Use a microplane to zest a lemon. I use mine all the time for zesting and cheese grating. Get a microplane here!